I love that line (among many others) from the certainly politically incorrect song "Jewish Princess" on Frank Zappa's album "Sheik Yerbouti" (1979). 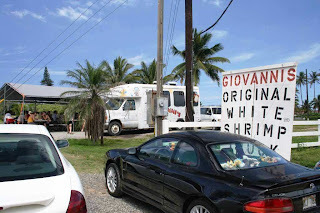 We left Hawaii the week before last, but not before visiting Giovanni's Original White Shrimp Truck, which you will find on the North Shore of Oahu, somewhere just beyond the Turtle Bay Resort. I guess I could give better directions than that, but there's really only one road that follows the shore and so you can't miss it. It's a little harder to get there these days with the road being partly blocked at Waiamea Bay due to a rock slide, though you can come via the eastern route. There are more than a few of these little stands or trucks parked along the road, and they've been feeding surfers, bikers, and hippies for years. 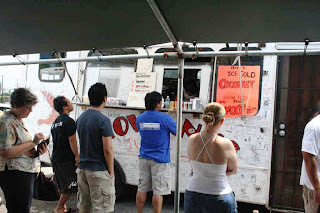 Cheap eats? Not really. The cost per plate was $12 (less than EUR 9, so I guess it isn't so bad!). In a remarkable sign of pricing power, the wait was quite long. Add $2 for the can of diet coke, please ... lunch for two, $28. Ouch. I wish I could say you were paying for the real estate, but the view is essentially a parking lot and a couple of surrounding mobile homes or run down houses. But they did offer cover in the form of awnings or tents, so you at least had some respite from the sun while being attacked by the bees and yellow-jackets that were also interested in your lunch. 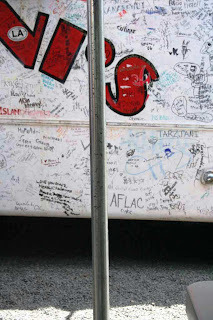 The schtick of this place is that people sign their names, poems, whatever to the side of the truck. There weren't too many German-looking names or inscriptions, and we didn't change that state of affairs since it seemed a bit cliche. At what point is it cool to be cliche or not be cliche? I've left my mark at dozen's of these places around the world, so I guess I've lost my appetite for it. Schade! I guess I'm getting old. But if you ever visit the Cafe Acores you can see what I looked like at a younger age and in a flight suit. But I didn't lose my appetite for lunch. I had the scampi, which they promised would have "lots of garlic," and it did not disappoint. That lunch revisited me for three days in more ways than I care to share on a public blog. 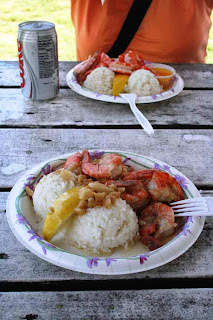 The Partnerin had the more sensible Lemon & Oil shrimp. Both were served with a generous helping of rice. I didn't count the shrimp ... I thought it might be a dozen, but from the photo it seems more like 8 to 10 per portion. It seems a bit steep for a place with essentially no overhead and high volume, but then again Hawaii has a social and tax infrastructure to rival that of Germany, so staff costs and the logistic costs of bringing stuff in and taking garbage out are probably considerable. I don't think the owner is getting rich, as like many of the other businesses on that side of the island it seems to be something of a lifestyle business. I will say that when I was eating the shrimp I thought that the garlifc was rather tame ... as mentioned before, it didn't manifest itself for a few hours and how! 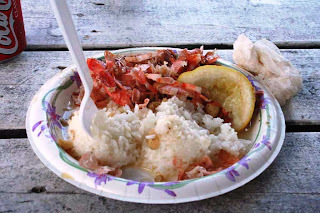 As for the rice ... well, lets just say that I wouldn't go out of my way to find this place for itself, but if you are out for the waves on the North Shore it (or the others) is not the worst way you could spend a lunch-hour. Nothing in Hawaii is cheap. Nothing. I am reading your blog for the first time in weeks and trying not to be jealous. Hawaii is a dream of mine. I will have to live through your pics for awile. Oh sweet garlic, how do I love thee....man, your post is making me hungry! !